1990 and the big record labels wouldn’t touch Paul Weller with a long pointed stick. 2006 and they can’t shower him with enough praise as the music industry offer up a Lifetime Achievement Award for his service to British music. And fully deserved it was too. 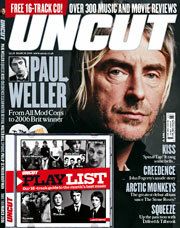 To celebrate this achievement, Uncut magazine has devoted much of its new issue to "The Modfather". The magazine features an exclusive 10-page interview with the man himself, talking about his humble beginnings, his career highlights and what he thinks of past Brit winners. There’s also a free 16 track CD featuring music featuring everything from The Arctic Monkeys to The Jam themselves. Should be in the shops now – you’d be daft not to pick it up.